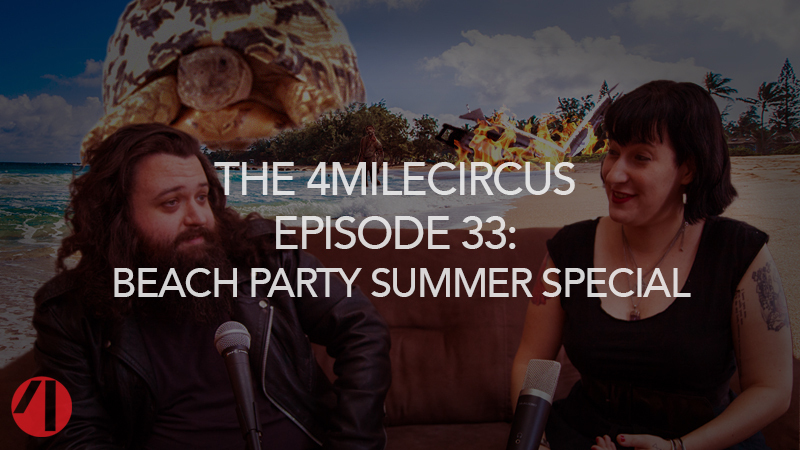 It’s The 4MileCircus Beach Party Summer Special! Nicole and Sean sit down with themselves to discuss what 4MileCircus has been up to over the last few months and what we have in the works for the rest of the year. They discuss shooting Sean’s upcoming short Rubber Ducky and shooting with Tara Cioletti (of his films Abel and Cain, Time Signature, and Meme) again. They also discuss Nicole co-directing previous guest Jeanette Sears’ short film Sanctuary and raiding Nicole’s grandmother’s house for era-appropriate props. Nicole also confuses chloroform for formaldehyde when discussing the contents of the cough syrup from her grandmother’s house. Nicole’s short horror film Small Talk is also now available streaming on Seed&Spark, which currently offers one month free when you subscribe. The film will also be playing at the Ax Wound and PDXtreme festivals later this year. As the beach they are on is invaded by hordes from Atlantis Sean and Nicole discuss who should be on their Zombie Apocalypse team (spoiler: not one another) and play a round of Mets trivia and a round of John Heard trivia.